You can use the command line application VeryPDF Image to PDF OCR Converter Command Line or the GUI application Image to PDF OCR Converter to convert image to searchable PDF document and edit PDF author simultaneously. If you want to use either of these two applications, please read the following contents. Please download the CMD application at its homepage. There is no need to install the application because it is a ZIP file which needs to be unzipped. After that, the executable file img2pdf.exe which is the called program in the conversion will be runnable instantly. Then you will be able to make the conversion by the command line application. Please open MS-DOS prompt window at first. You can use the shortcut key “Window”+ “R” to open “Run” dialog box. Then input “cmd” in “Open” combo box and click “OK” button. Input the command line which is consisted of called program, options for setting different functions, target file and source file. The specific command line template is shown in the contents below. At last, you need to hit “Enter” button to run the conversion from image to searchable PDF. img2pdf stands for the called program. Please use its path when you write the command line. -x 1 is to generate searchable PDF document. 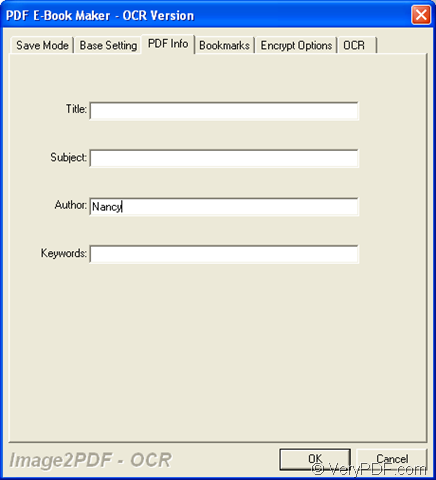 –a Nancy is for setting PDF author as “Nancy”. –r 1200 is to customize PDF resolution as 1200 DPI. -o c:\sample.pdf is the path of target file. c:\input.tif is the path of source file. 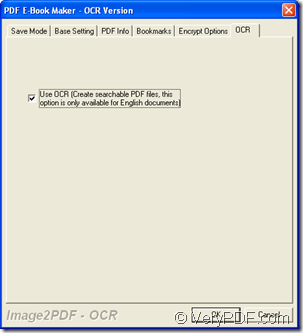 Please download Image to PDF OCR Converter by clicking the URL: http://www.verypdf.com/app/image-to-pdf-ocr-converter/index.html. Then please install it on your computer, which is easy enough just by following the installation wizard. If you like, you can create a desktop icon for conveniently opening the application. Double click the application icon to open it. If there is no application icon, please click “Start”—“All Programs”—“Image2PDF OCR v3.2”—“Image2PDF OCR v3.2” for opening the application. Then you will see the main interface of the application which is a clear and friendly one. Please click “Add File (s)” button to open file picker window from which you are able to choose the image file you need and please click “Open” button to add it into file list of the interface. 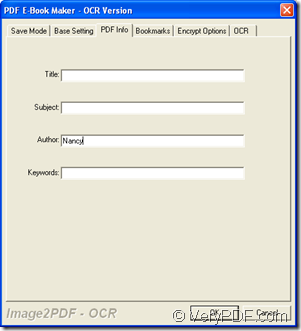 Click “Setting” button to open “PDF E-Book Maker-OCR Version” dialog box. Two tabs in the tab control will be used—“PDF Info” and “OCR” tab. By clicking “PDF Info” tab, you can input PDF author in “author” edit box. By clicking “OCR” tab, you can check “Use OCR” option to activate OCR function. Then please click “OK” button. You can see these two tabs in Figure 1 and Figure 2. Click “Make PDF” button at last. In popup floating item please choose “convert selected 1 file into pdf file” to open “Save as” dialog box. Then you can save the target file in this dialog box and run the conversion from image to searchable PDF document. 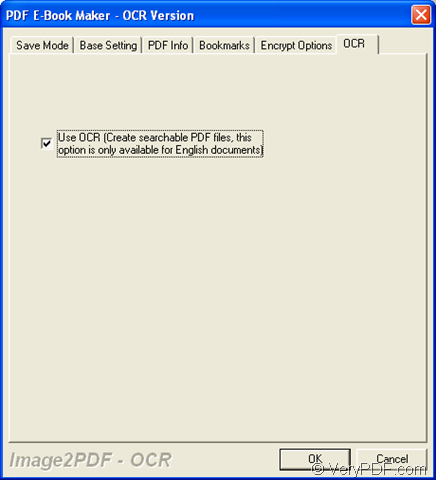 How to convert PDF or other image to searchable PDF file in batch mode? How to print rtf to eps file? How to Convert PXL to JPEG? This entry was posted in VeryPDF Blog and tagged image to searchable PDF, PDF Author. Bookmark the permalink.